Spišské Podhradie, a UNESCO site of World Cultural Heritage that lies in the shadow of majestic Spiš Castle, once had a mixed population of Slovaks, Germans and Jews. Jews settled here only after a ban on their residence was lifted in 1840. The town became a rabbinical center, and its Jewish population grew from 219 in 1869 to 458 in 1940. The community, which adhered to the Orthodox stream, maintained a yeshiva and other institutions. Today, no Jews live here. Only the synagogue in town center and the neglected Jewish cemetery, about 3 kilometers outside of town to the north, bear witness to the Jewish past. The synagogue has been undergoing a fitful restoration process for years. The building is already used for cultural purposes, and there are plans to install a new permanent exhibition in the women’s gallery as a branch of the Museum of Jewish Culture in Bratislava. The simple building was constructed around 1875 and restored after a fire in 1905-1906. 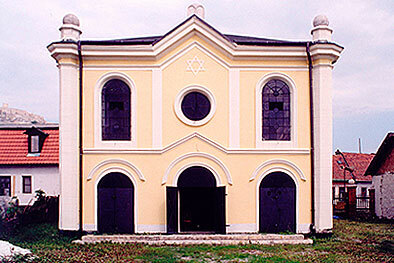 It is a typical example of nineteenth century provincial synagogue architecture, with its eastern façade oriented to the street and accentuated by four polygonal pillars with massive stone balls. The interior has been relatively well preserved; the women’s gallery is supported by cast iron columns, and the original ark (aron hakodesh) is still in place. The splendid decorations are currently being restored.